Several performance fixes here & there. A given region is limited to no more than 1000 items. Currently only three regions have more than this, so it shouldn't be a big issue. (Also, at ~500 items/region the client starts to lag. By 1K it's rather choppy. May need to adjust this limit more in future, and/or do client-side optimization to support it). You can sell all items in your inventory with the command /sellallinv. You will sell back items to the shop at 1/5 current retail price. Plat items are NOT affected. Items you have placed in the world already are NOT affected. Free grass tiles (dark grass, not light grass) are sold at .05/unit, since they are not purchasable via the shop, and are generally worthless. I plan to make a drag&drop version of this in future so you can sell back specific items. If you have a LOT of items in your inventory, you may need to execute the command multiple times to sell them all. 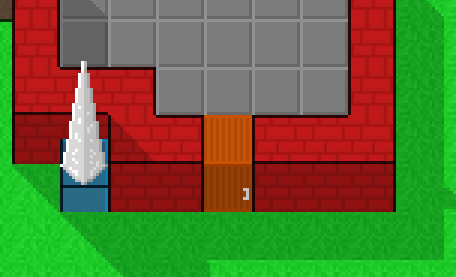 This patch helps with lag, but I still have more work to do -- expect more fixes tomorrow! Inventory Return system is up - now if a mayor/town official picks up someone's block, it is returned to original player's inventory. Wow, more than 20,000 registered players! After spending three days rendering more than 65,000 screenshots... the map is done! 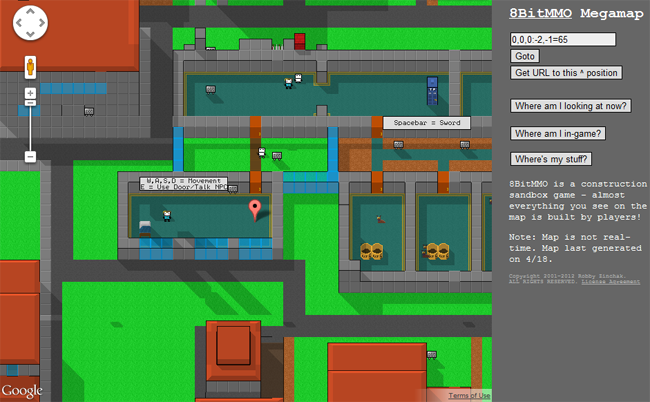 You can browse the map as a guest by heading over to 8BitMMO.net/megamap. Or even better, launch the map from in-game via Menu > Map to see a marker of where your character is. Go to any position - Type any coordinates (you can use full coords such as 0,0,0:0,0=65, or just region coordinates 0,0) to see that location in the map. Get position you are looking at - If you are scrolling around and wondering where a given position is so you can visit it in-game, click 'Where am I looking now?' - the answer will be shown in the coordinates input box. Get URL to this position - Click this to get a URL to the position entered in the coordinates box. Great for sharing your work with friends! Where's my stuff? - (only if map launched from in-game) If you have lost your building, click this to find out which areas contain your blocks. Clicking a given position listed will zoom the map there and place a marker nearby.